This method evaluates the periodontal behavior to a defined percussive force applied by a tapping device. The amount of deflection is displayed by a value called the Periotest Value, which is calculated by the device from the contact time between tapping the head and the tooth. The PTV range from - 8 to + 50, and are reported to correspond to four degrees of mobility reported by Miller, and the total deflection of the maxillary central incisors is determined by periodontometry. A strong correlation was noted between tooth mobility and bone loss. Probing depth, recession, and bleeding index have shown low to no correlation with Periotest Values. Thus, this study is designed to evaluate the association of PTV with the amount of bone and clinical attachment loss resulting in mobility of teeth, and the clinical indices obtained from different groups of people. The study was carried out in the Department of Periodontics, Rural Dental College, Loni, in coordination with the Department of Oral Medicine and Radiology, Rural Dental College, Loni. The subjects were characterized as healthy, that is, with healthy periodontium (group A: n = 30) and those with chronic generalized periodontitis (group B: n = 30), with the following inclusion and exclusion criteria. Informed consent was taken from every patient. The inclusion criteria were age group between 18 and 55 years, generalized probing depths of 3 to 8 mm, periodontally healthy subjects (group A), and chronic generalized periodontitis (group B). The exclusion criteria were, history of systemic illness, pregnancy, lactating mothers, and patients with a history of systemic diseases, periodontal therapy within three months prior to enrollment, previous orthodontic therapy, trauma from occlusion, history of trauma, malocclusion. The subjects who befitted the inclusion criteria were comfortably seated on the dental chair and the Plaque Index was recorded (Silness and Loe). Also the gingival index was recorded by the examiner (Loe and Silness). A computerized pressure sensitive probe (Florida Probe TM ) was first used to measure the probing depth around each tooth at six sites. The sites were misobuccal, buccal, distobuccal, mesiolingual, lingual, and distolingual. All the measurements were recorded on a patient sitting upright. During the measurement, the maxillary teeth and mandibular teeth were not in contact. Also, the tongue had to have no contact with the teeth. The patient was instructed to open his mouth just a little, to facilitate measurement in the lateral zone. An average of the three PTV obtained was calculated. Statistical analysis was carried out using a student's unpaired t-test. 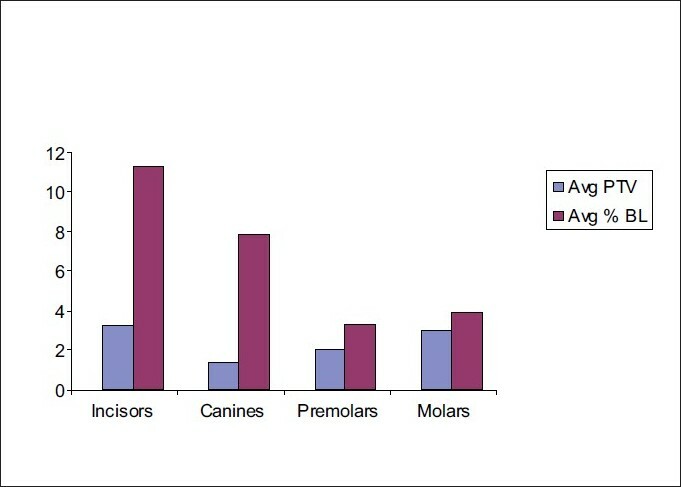 When the average PTV in the upper arch were compared with average clinical attachment level it was found that the PTV in the incisor, canine, premolar, and molar regions were significantly related to the clinical attachment level [Figure 1]. 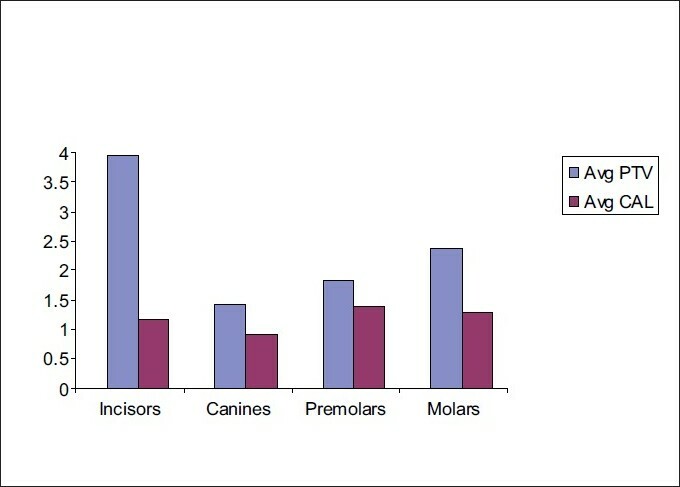 When the PTV in the maxillary arch were compared with the percentage bone loss, it was found that in the incisor, canine, premolar, and molar regions the PTV values were significantly influenced by average percentage bone loss [Figure 2]. When we compared the PTV with the average clinical attachment level in the mandibular arch, in the healthy group, we found that the relation between them was highly significant [Figure 3]. When the average PTV were compared with the average percentage bone loss in mandibular arch, in the healthy group, it was found that the relation was highly significant in all the four groups of teeth [Figure 4]. When the average PTV were compared with the average clinical attachment level in maxillary arch, in the periodontitis group, it was found that the values were highly significant in the incisor, premolar, and molar areas. However, the value was found to be insignificant in the canine region [Figure 5]. The average PTV in the maxillary arch were compared with the average bone loss in the periodontitis group, and it was found that the relation was highly significant in all the four groups of teeth [Figure 6]. The average Periotest value when compared with the average clinical attachment level in the mandibular arch, in the periodontitis group, the difference in mean was found to be significant, indicating that the clinical attachment level influenced PTV [Figure 7]. When the average PTV were compared with the average percentage bone loss in the mandibular arch, in the periodontitis group, it was found that the bone loss significantly influenced the PTV in the mandibular arch in all the four groups of teeth [Figure 8]. The Periotest S, a mobilometer is an objective, dynamic measuring procedure, for evaluating damping characteristics of teeth. Muhlemann et al. stated that biophysical property of the periodontal ligament was more important in increased tooth mobility. Hence, this study was undertaken to assess the association between PTV and bone loss, clinical attachment loss, and plaque and gingival indices. As observed by van Steenberghe et al. there was a slight increase in Periotest value at 11 am and 2 pm, but it was not observed at 9 am and 5 pm. They found that the difference observed at 11 am and 2 pm was statistically significant. The Periotest method evaluates periodontal behavior to a defined percussive force applied by a tapping device. The amount of deflection was indicated by PTV. It was necessary to evaluate the loss of periodontal support in clinical terms by using clinical attachment level measurements. As the extent of tooth deflection was determined in an orofacial direction by the mobility meter, one might think that the amount of clinical attachment loss at the midpoints could have a higher influence on PTV compared to the overall and proximal clinical attachment level evaluations. The overall clinical attachment level measurements and measurements obtained from the proximal and midpoint aspects revealed that the former produced the highest predictive value among all. This indicated that the mobility meter device had evaluated the overall support of the periodontal structure rather than the support in the direction of the percussive movement. According to Muhlemann et al.,  all periodontal tissues, and even the hard tissue of the tooth, are loaded during total deflection. On account of the short period of tooth deflection (approximately one millisecond) during the Periotest measurement, the displacement of the fluids in the vascular system of the periodontium plays only a subordinate role. 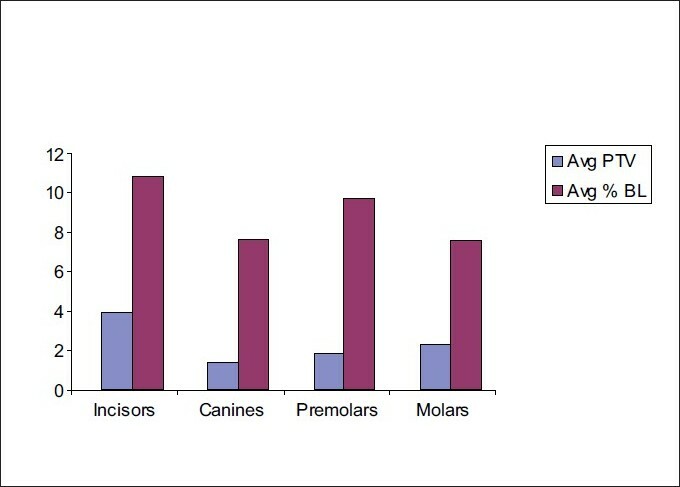 When in the periodontitis group average, the PTV of the incisors, canines, premolars, and molars were compared it was found that the difference in mean was higher in the incisors and canines when compared with the premolars and molars. The P value was found to be statistically significant, with a higher value in the mandibular arch, (P < 0.05). This difference could be due to the fact that the anterior teeth had a conical single root and less root surface area compared to that of the molars and premolars, which had multiple and curved roots in both arches. 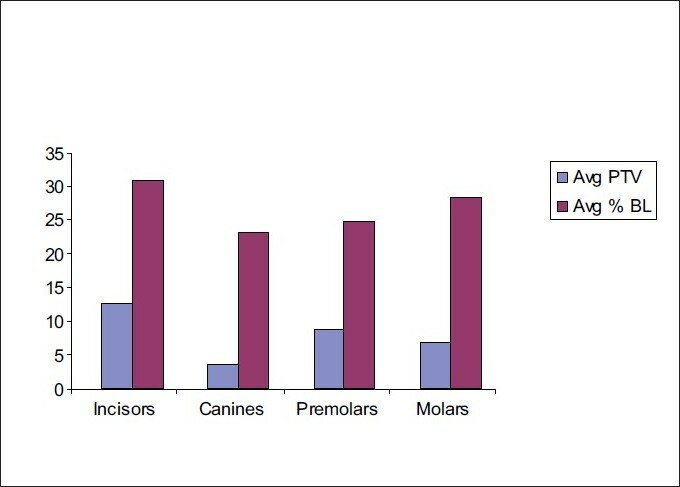 Also the root length of the mandibular anteriors was less than that of the maxillary anteriors, indicating that they had less root surface area compared to the upper anteriors. 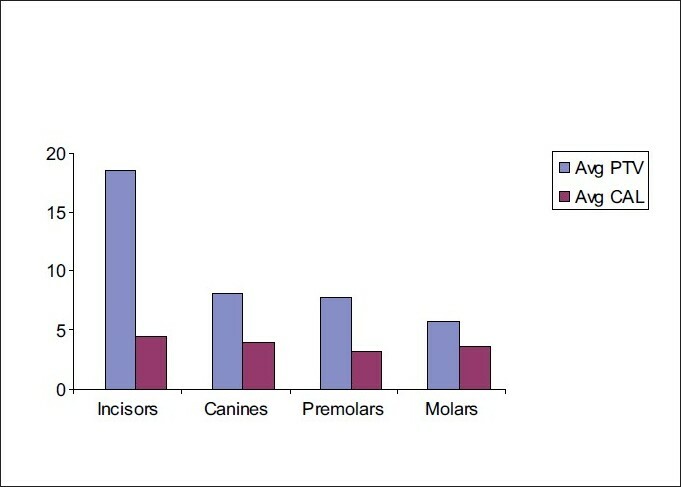 Average bone loss on comparison in the mandibular and maxillary incisors, canines, premolars, and molars showed a significant difference in the incisor and canine regions. 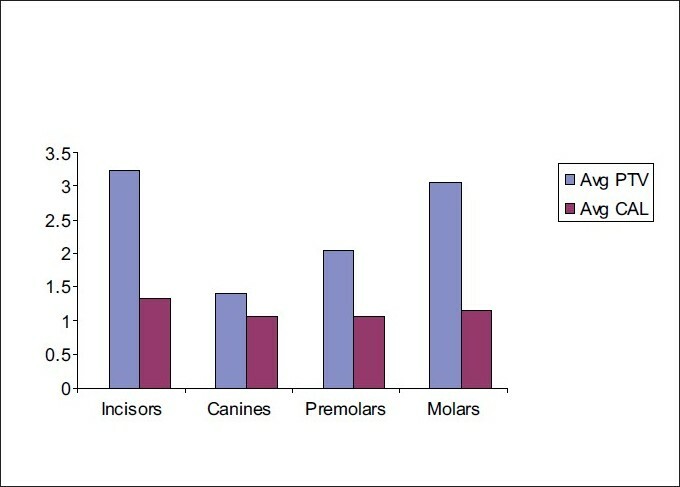 The difference was highly significant in the incisor area (P < 0.01) than in the canine region (P < 0.05). Schulte et al. stated that when there was bone loss in the maxillary and mandibular arches, higher PTV value was found in the maxillary arch. Our study did not support this finding. Damirel et al. in his study stated that tooth mobility depended on the location of the tooth in the arch. In their study, they found that as the lower teeth had less root surface area compared to upper teeth, they had a higher Periotest value compared to the maxillary teeth. Our findings agreed with this study. When a comparison was made between the Plaque index (Silness and Loe) and Gingival index (Loe and Silness) in subjects with healthy periodontium and in subjects with periodontitis, a statistically significant relation was established. It was found that, as there was loss of periodontal supporting tissue the PTV increased significantly, indicating that the damping characteristic of the periodontal ligament had reduced. The increase in PTV in both arches when compared to the PTV in healthy subjects was found to be statistically significant. When comparing the PTV in the mandibular and maxillary arches, a statistically significant difference was found in the incisor and canine areas. Higher PTV were found in the mandible than in the maxilla. This was in accordance with the study by Damirel et al. who pointed out that with progressive bone loss there was an increase in the Periotest value. He had found a negative correlation between the Periotest value and the maxillary posterior teeth. This difference might be due to the position of the head of the Periotest S handpiece. 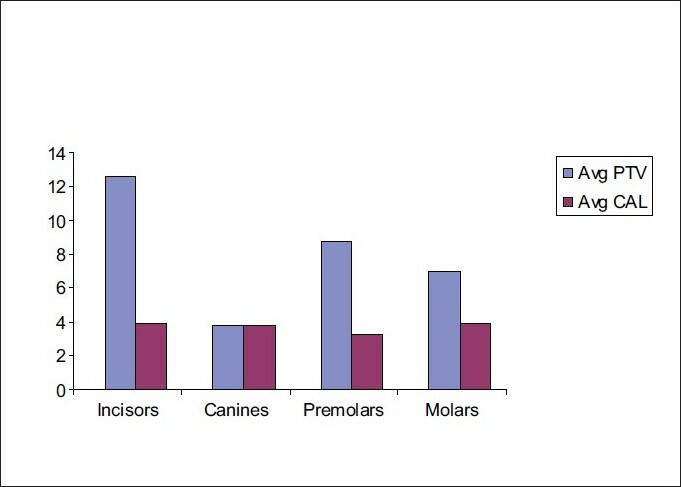 Also the difference between the clinical attachment levels was significant in the canine and premolar regions. Ericsson and Lindhe,  in an animal experiment, induced periodontal tissue breakdown and observed that loss of connective tissue attachment and alveolar bone were symptoms that occurred concomitant with increased tooth mobility. The authors concluded that the increased tooth mobility "was mainly the result of the apical displacement of the alveolar bone margin and of the corresponding apical shift of the fulcrum of the movement of the crown of the teeth in the tooth mobility measurements". The importance of the amount of residual alveolar bone for tooth stability was also emphasized by Lindhe and Nyman. Similarly Persson and Svensson  showed that individuals with periodontal disease had larger and more varying tooth displacement values than healthy subjects. It was concluded that the hypermobility recorded at sites with a reduced and diseased periodontium was due not only to the loss of alveolar bone, but most probably, was also associated with the quantitative and qualitative alterations in the periodontal ligament and supralveolar soft tissues. Also Muhlemann ,,, observed that at periodontally compromised teeth both the 'initial' (ITM) and 'secondary' (STM) tooth mobility values were elevated. The author suggested that qualitative alterations in the periodontal membrane might contribute more to tooth mobility alterations than quantitative changes in the bone level. Furthermore, Muhlemann  proposed that an altered function of the periodontal ligament could also affect, besides the displacement of the root within the alveolar socket, the transmission of the forces to the alveolar bone and thus the STM value. Schulte et al. showed that the percentage of bone loss was the parameter that was most highly correlated to the Periotest score. Physiological tooth mobility was due to the intra-alveolar displacement of the root and bone distortion. The magnitude of force applied labially or lingually to the crown decides whether the crown excursion is associated with root displacement only or with root displacement and bone distortion. It has been shown that the resistance offered by the tooth supporting tissues against moving or tipping of the crown is very low in the initial phase of tooth mobility. Within the range of initial tooth mobility produced by forces up to 100 g, the crown excursions are relatively large, and must be intra-alveolar root displacement. This leads to a change in the width of the periodontal ligament. The Periotest S has a head of 8 g and hits the tooth 16 times in four seconds. When PTV in subjects with healthy periodontium were related to the clinical attachment level and bone loss it was found that the relation was statistically significant. This indicates that the PTV are low when the bone loss and clinical attachment loss is less. This explains the fact that the alveolar bone and connective tissue attachment play an important role in maintaining tooth equilibrium. Picton D. C. A  concluded that the four factors that include tension, compression, hydrodynamic damping, and viscoelasticity have a contributory effect in resisting the displacement of a tooth when force is applied. When PTV were compared with the clinical attachment level and PTV in subjects with periodontitis, it was found that the values of Periotest were significantly related to bone loss and clinical attachment level in both the anterior and posterior region. The PTV increased with increased bone loss and clinical attachment level. The Periotest value increase was higher in the lower arch, as the root surface area was less in the lower arch and bone loss was higher as compared to the upper arch. This was in agreement with the study of Lukas,  Damirel et al.,  and Khoo et al. Muhlemann  in a review stated that the increase in tooth mobility in the disease was due to a simultaneous increase of both initial intrasocket movement and subsequent displacement by periodontal bone distortion. Khoo et al. showed a high correlation of tooth mobility with the attachment level, but lesser correlation with bone loss. Also the acceptability of Periotest S as a device to measure tooth mobility was very well accepted by the patients, due to its noninvasive and simple design. Andresen et al. used the instrument to assess tooth mobility in children and found that the device was well-accepted by children too. Thus, from the above discussion it is obvious that tooth mobility is related to clinical attachment level and bone loss. 1. Damirel K, Gur H, Meric H, Sevuk C. Damping characteristics of teeth with periodontal breakdown: Correlation of mobility meter values with bone and attachment loss. J Periodontol 1997;68:166-71. 2. Muhlemann HR. Tooth Mobility- A Review of Clinical Aspects and Research Findings. J Periodontol 1967;38:686-708. 3. 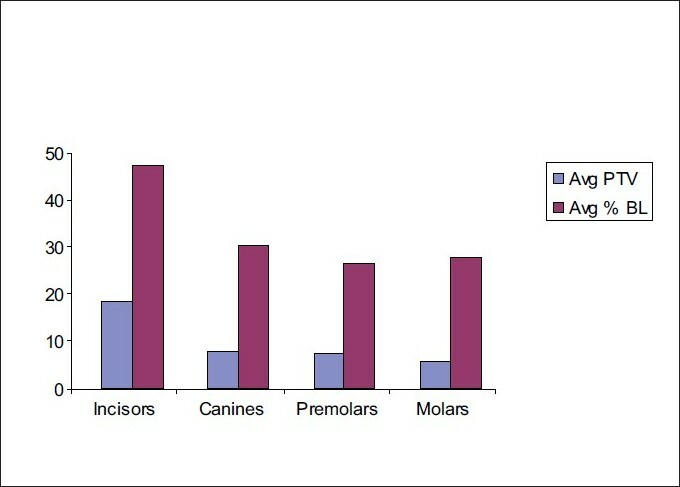 Peter S. Indices used in Dental Epidemiology. Essentials of Preventive and Community Dentistry. 456-552. 4. Beck J, Arbes S. Epidemiology of gingival and periodontal diseases. Carranza's Clinical Periodontology 9 th ed. 2001:74-95. 5. Schulte W, d'Hoedt B, Lukas D, Maunz M, Steppeler M. Periotest for measuring periodontal characteristics - correlation with periodontal bone loss. J Periodontol Res 1992: 27:184-90. 6. Periotest. Dynamically diagnosing the periodontium and the dental implant-bone interface. Instrument catalogue. Available from: http://www.seimensdental.com [Last accessed on 2002]. 7. Van Steenberghe D, Rosenberg D, Naert IE, Van den Bossche L, Nys M. Assessment of periodontal tissues damping characteristics: Current concepts and clinical trials. J Periodontol 1995:66:165-70. 8. Pameijer CH, Stallard RE. A method for quantitative measurements of Tooth mobility. J Periodontal 1973;44:339-46. 9. Khoo KK, Watts TL. Upper anterior tooth mobility selected associations in untreated periodontitis. J Periodontol 1988;59:231-7. 10. Lukas D, Schulte W. Periotest - a dynamic procedure for the diagnosis of the human periodontium. Clin Phys Physiol Meas 1990:11:65-75. 11. Muhlemann H, Zander H. Tooth Mobility (III): The mechanism of Tooth Mobility. J Periodontol 1954;25:128-37. 12. Schulte W, Lukas D, Ernst S. Periotest values and tooth mobility in periodontal disease: A comparative study. Quintessence Int 1990;21:289-93. 13. Ericsson I and Lindhe J. Lack of significance of increased tooth mobility in experimental periodontitis. J Periodontol 1984;55:447-52. 14. Lindhe J Nyman S. Examination of patients with periodontal disease. Clinical Periodontology and Implant Dentistry. 4 th ed. 2003:403-13. 15. Persson R, Svensson A. Assessment of tooth mobility using small loads. I Technical devices and calculations of tooth mobility in periodontal health and disease. J Clin Periodontol 1980:7:259-75. 16. Muhlemann H. Tooth mobility: The Measuring Method, Initial and Secondary Tooth Mobility. J Periodontol 1954;25:22-9. 17. Parfitt GJ. Measurement of the physiologic mobility of individual teeth in an Axial Direction. J Dent Res 1960;39:608-18. 18. Picton DC. Tooth Mobility - an update. Eur J Orthod 1990;12:109-15. 19. Lukas D, Schulte W, Konig M, Reim M. High-speed filming of the Periotest measurement. J Clin Periodontol 1992;19:388-91. 20. Andresen M, Mackie I, Worthington H. The Periotest in traumatology. Part I. Doest it have the properties necessary for use as a clinical device and can the measurements be interpreted? Dent Traumatol 2003;19:214-7.